Elegantimage, a winner in 20 of her 41 career starts, added another first to her impressive resume by becoming the first horse inducted to the Canadian Horse Racing Hall of Fame for both owner Doug Millard and co-breeder Harry Rutherford. The Balanced Image bay, out of Éclair Hanover, always managed to stand out from the crowd. “She wasn’t a bossy filly in the paddock, but she didn’t take any crap off the other ones. She had that same attitude on the track, she hated to have a horse go by her,” said Rutherford. Her Hall of Fame credentials are plentiful. She posted a race record of 20-7-3 and lifetime earnings of $955,368 in 41 races for owners Hyatt Holdings, Doug Millard, Jerry Van Boekel and Hall of Famer Steve Condren, who doubled as her driver. Millard eventually bought out his co-owners and enjoyed continued success with Elegantimage as a broodmare. 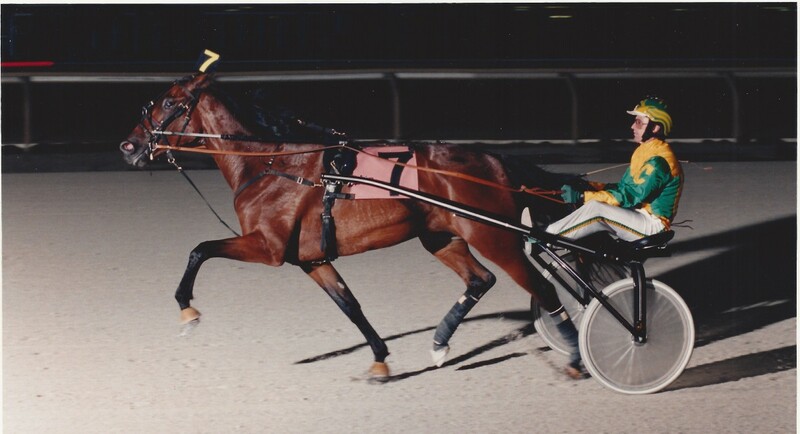 A $53,000 yearling purchase at the Canadian Classic Sale in 1995, Elegantimage was an overnight success winning three Ontario Sires Stakes events in five starts along with the Oakville Trot, Robert Stewart Memorial Final, two Trillium Series events and the Canadian Breeders Championship Final. Trained throughout her career by Brad Maxwell, Elegantimage was named Canada’s Two-Year-Old Trotting Filly of the Year for her efforts. She went to post as the prohibitive favourite in 20 starts and rarely let her backers down. “This horse wanted to win and had a chance to win every time she raced. She was a top filly for sure but you weren’t going to make a lot of money betting her,” said Millard, laughing. One of Millard’s favourite moments of that initial campaign came from a call courtesy of the dulcet tones of former Woodbine and Mohawk track announcer Frank Salive. “She must have been 10 lengths ahead and Frank said, ‘Ladies and gentlemen, you’re looking at the making of a world champion trotting filly!’ That was a quite a call,” Millard said. Elegantimage continued to dominate as a sophomore winning eight of 10 OSS starts setting a lifetime mark of 1:55.4, and winning the 1997 Canadian Breeders Championship final en route to receiving the O’Brien Award in the three-year-old trotting filly division. She was retired following a brief four-year-old campaign and quickly became a successful broodmare with progeny earnings of $986,223 and an average earnings per starter of $140,889 at the time of her Hall of Fame induction. “She produced a pair of pretty good racehorses in Body Balance, who we lost in the fire, and Elegant Serenity who we just retired,” said Millard. Elegant Serenity, a winner of over $500,000 with a mark of 1:53.2, is the top earner of her offspring while Body Balance, who perished tragically in the fire at Classy Lane, banked just shy of $200,000 in a hard-knocking career. Elegantimage, was 23 at the time of her induction, and retired, for the most part, to Spring Haven Farm in Ohio. “The last couple yearlings out of her were the best she had. Elegant Serenity is now retired and in foal to Muscle Hill,” said Millard who will enjoy seeing the family line continue. For co-breeder Harry Rutherford, he’ll always look back fondly to Elegantimage as the start of a production line for their small breeding outfit that would go on to make such stars as Pure Ivory ($1,442,888) and Casual Breeze ($1,347,330). “We were small breeders at the time and to come out with a winner like her it was a great thing. Elegantimage made just under a million, but it was a different era. She was the best horse we had bred at that time, that’s for sure,” said Rutherford. The proud breeder found a poignant way to convey just how dominant a racehorse Elegantimage was in her sophomore season. Both Millard and Rutherford remain in awe of the accomplishments of their great trotting filly.